General Description: Oxeye daisy is a perennial herbaceous plant that reaches 1 to 3 feet tall. It has shallow, branched rhizomes and adventitious roots. The entire plant has a disagreeable odor when crushed. Flower Description: Single flowerheads at the ends of stems have brown-edged, green bracts at their base. Each ‘daisy’ is a cluster of many flowers, the ray flowers are white and look like petals. The disk flowers are small and yellow and make up the center. Leaf Description: Leaves are alternate and lance shaped with coarse teeth or lobes. Basal leaves with petiole (leaf stalk) and stems leaves become sessile (no stalk) and smaller in size moving up the stem. Stem Description: Stems are unbranched or branches near the tip. Fruit/Seed Description: Seeds are small and have 10 small ridges. It aggressively invades fields where it forms dense populations and decreases plant species diversity. Oxeye daisy decreases crop yields and is a weed of 13 crops of 40 countries. It is a particular problem in pastures. 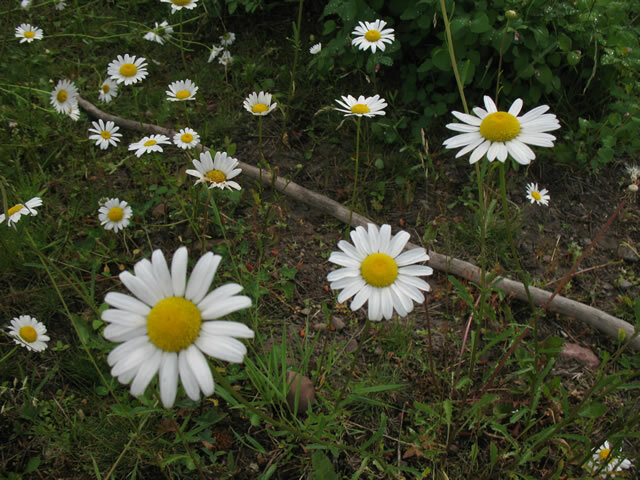 Oxeye daisy was changed from a Class B to a Class C noxious weed in 2013.